I am enjoying my Dining Room chalkboard niche. especially during holidays or change of seasons. I wanted to write my favorite Easter verse, but also wanted to keep the script simple so as not to distract from the meaning. but I just began writing and tried to center it as best I could. 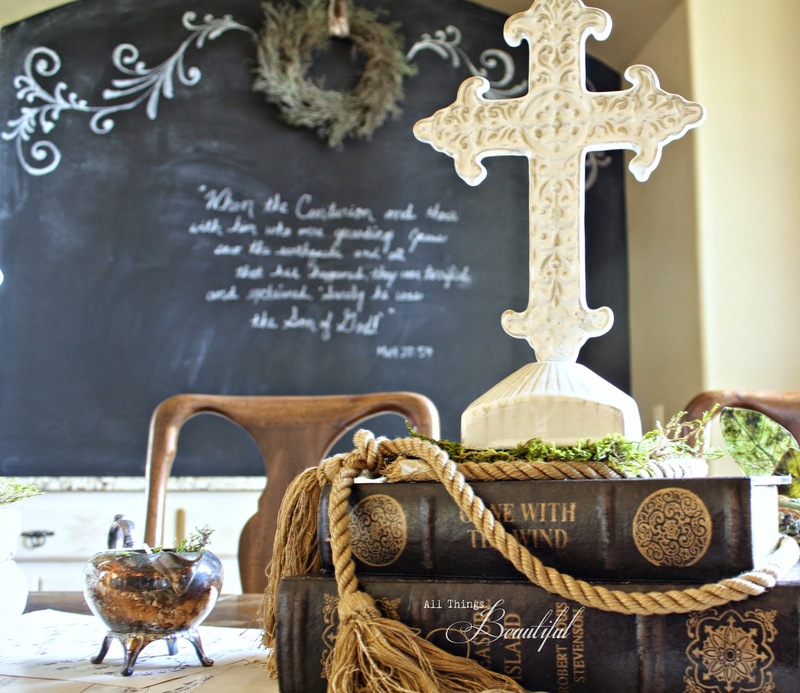 If you'd like to see how I built the tablescape, click here. and exclaimed, 'surely he was the Son of God!' "
mainly because the Centurion was a Roman. so he witnessed the entire scene. 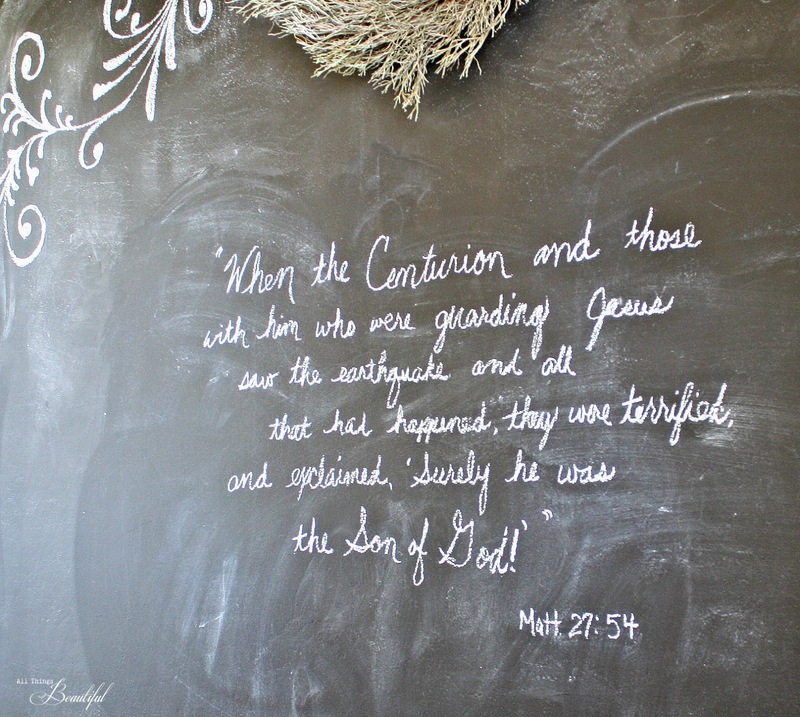 and speaks his claim..."Surely he was the Son of God!" Okay this is just too cool and so much fun. Do you realize how many people have these alcoves in their dining rooms and this is such an awesome idea! Hi Janis! Thanks for sharing this great Bible verse! Your dining room is beautiful! I know your are probably missing your home and your family. I hope you are feeling OK and are encouraged. Thinking of you! That nice is amazing!! LOVE what you did with it!! What a lovely display. I think your handwriting is great, it's hard to write level, mine always has an uphill slant. I certainly wish the best for you, Janis. 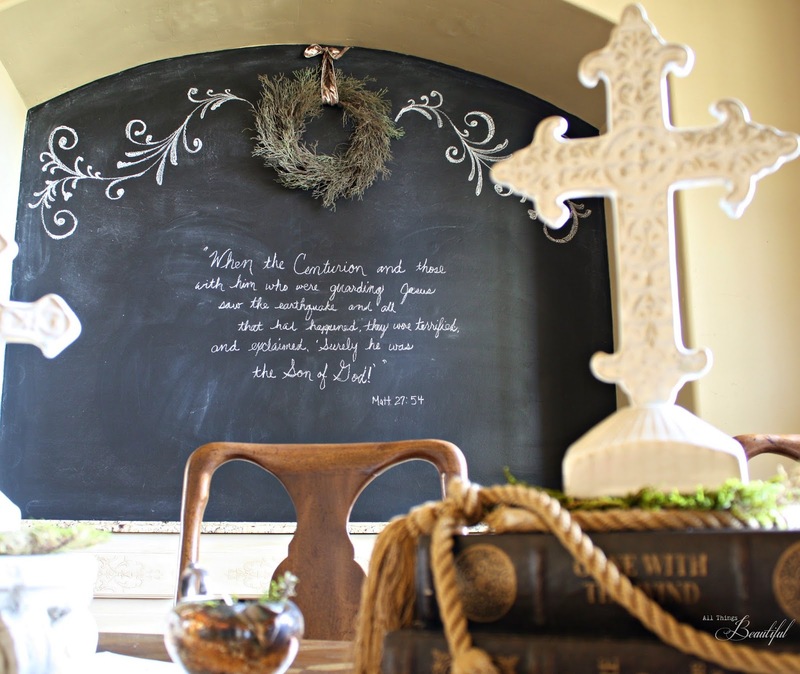 When I get a grown-up dining room like yours, I want to have a chalkboard niche just like yours! It rocks! What a great idea for that niche, Janis! It looks lovely and I like that you change up the writings you put there to go with the seasons/holidays. Your table is looking lovely as well! Not sure how I missed this post, Janis; but, I am so glad that I am catching up now! 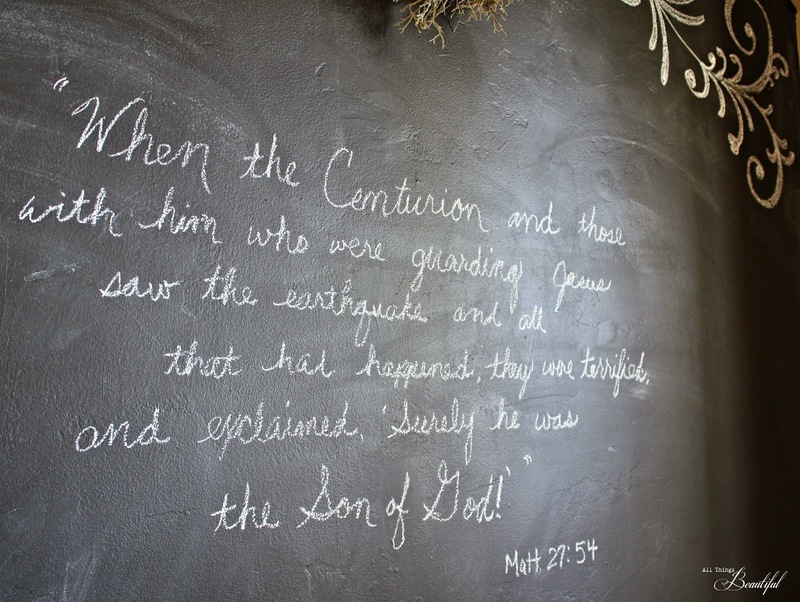 What a beautiful verse for Easter! 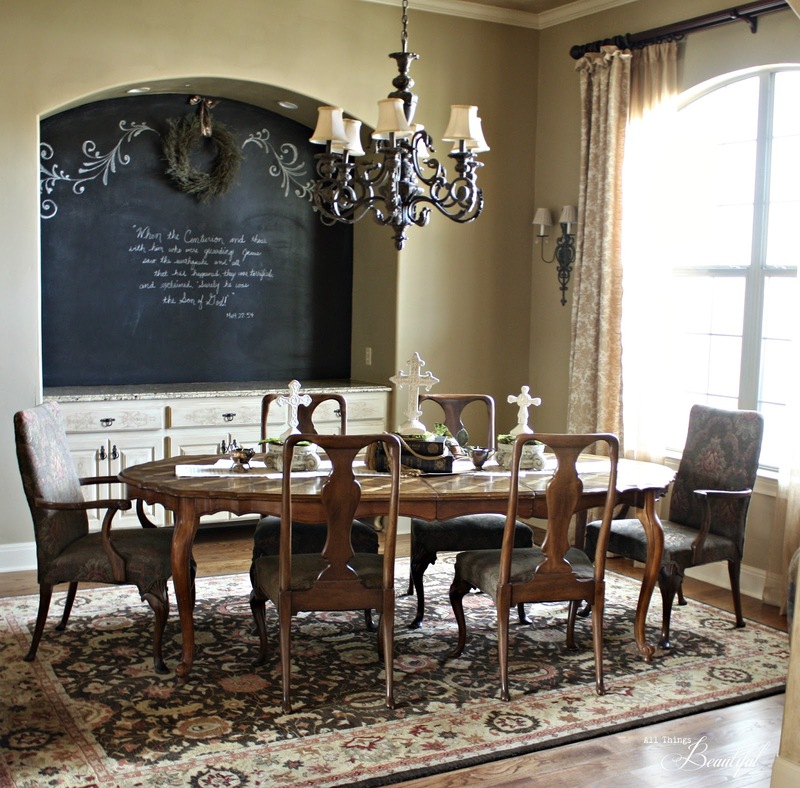 The chalkboard looks great in your dining room niche! Perfect use of the space!